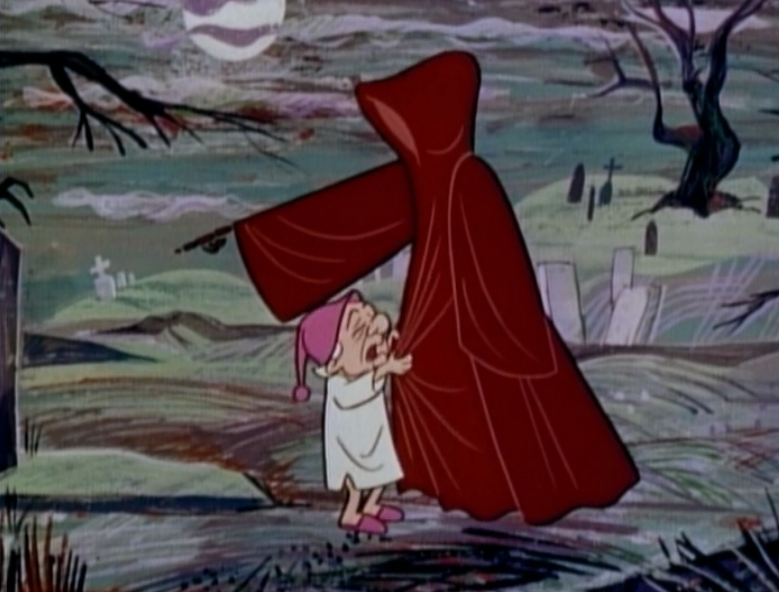 Probably Mr. Magoo’s Christmas Carol because I watched it when I was a kid whenever it was on, and my children insist on watching it at least once per year. This is a difficult question because there are so many. I’m going to go with “Jolly Holiday” (comp. 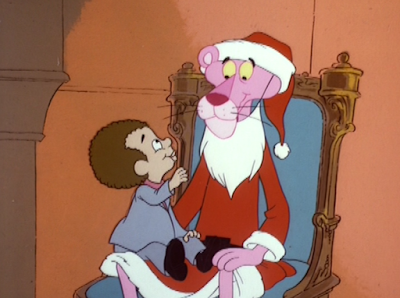 by Doug Goodwin) from the 1978 special: The Pink Panther in A Pink Christmas. It’s a wonderful holiday song that should be better known. Runners up: “I Believe in Santa Claus” from The Year without a Santa Claus; “Christmastime is Here” from the Charlie Brown special. I also have a weird affection for two SNL performances: The Roches performing the Hallelujah Chorus and the 1980 Pirates of Penzance cast (w/ Rex Smith and Linda Ronstadt) performing a Christmas medley starting with O Come Emmanuel. The Alastair Sim Christmas Carol from 1951 is incomparable. Runners up: Mr. Magoo’s Christmas Carol with those wonderful Jule Styne/Bob Merrill songs; Albert Finney’s Scrooge the Musical with those wonderful Leslie Bricusse songs, and the 1971 Ken Harris animated Christmas Carol, which is a masterpiece of animation during a decade that was not good to that art form. I though How Murray Saved Christmas was unbelievably bad. Frosty Returns is a sad travesty since there is a genuine Rankin Bass sequel that CBS could play that doesn’t betray the original and ignore Christmas in favor of an environmental message. The Osmond produced It Nearly Wasn’t Christmas is sooo bad that it’s good. (Santa’s dead, take that kids! Why is it snowing in a mall?) Bruce Vilanch as a giant elf! Poor Ted Lange, so far from Wattstaxx. It’s so campy bad, I could watch it again and again. It deserves its own Rocky Horror Picture Show-style commentary. 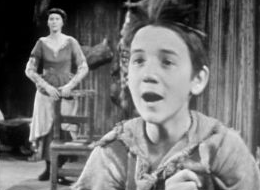 from 1955 production of Amahl and the Night Visitors. Look at the success of a Lucy rerun, colorized and played in prime-time as a Christmas special. People love Christmas specials that don’t feel ephemeral, that are rooted in people’s memories or in tradition. I agree with you that, properly marketed, (“for the first time on Network television in 35 years….”) networks could run nostalgic replays of Christmas specials and people would watch. How about an Amahl and the Night Visitors live musical broadcast? Kevin pulled out some rare specials - which is great! And Kevin, you have a very good point about I Love Lucy... there is definitely a lot of love for those specials being reaired. I wish we could have an organized "station" on YouTube, Roku or some other service that provided the chance to see these great specials again. Kevin, if i am correct , you are referring to Frostys Winter wonderland as the more honorable sequel to the original Frosty. This i fully agree with! Frosty returns was terrible. Absolutely. Frosty's Winter Wonderland was authentic Rankin Bass with the original voice cast (Jackie Vernon, Paul Frees), Maury Laws arrangements, Paul Coker designs and a Romeo Muller story. Add Andy Griffith, Dennis Day and Shelly Winters. Just so, so, so much better. Frosty Returns actually had a good voice cast, but it was wasted. Good selections, Kevin. I love that Roches performance from SNL, I watch the dvd every December. And "I Believe In Santa Claus" is a very touching song. I'm genuinely impressed with everyone's ideas about suggestions to TV execs--question #5--in the blogathon. Wouldn't it be great if someone who works in the industry took note of these suggestions? Thanks for participating, Kevin. Enjoyed reading your Christmas favorites, Kevin. Just by the very mention of the Peanuts Gang, and "Christmastime is here"... I can hear that sweet melody in my mind. So beautiful and sweet are the sounds of childhood and Christmas! Awesome. Just goes to show the variety of Christmas entertainment out there - something for everyone!